This is a “Fujima Style” Japanese “Buyo” class. With a strong influence from Kabuki, “Fujima Ryu” is one of the largest schools of “buyo” - characterized by its powerful and large gestures. 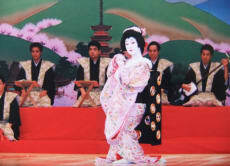 People dressed as “Geishas”, “Maikos”, samurais, and everyday people dance a variety of dances. Because lessons can be taken in English or Chinese, we have people participating from around the world as well. It's my wish that as many visitors as possible experience traditional Japanese entertainment.